12.5" RCOS @ ~f/9 (2880 mm fl) 0.64 arcsec / pixel. The Zoomify image scale is 0.64 to 3.59 arcsec / pixel. SBIG STL-11000 w/ FW8-STL filter wheel, AstroDon Gen II Filters. 5/29/2013 to 6/11/2013 Chino Valley, AZ... with CCDAutoPilot5 & CCDSoft. AOL guided. eXcalibrator v4.1 for (g-r) color balancing, using 54 stars from the SDSS-DR9 database. CCDStack to calibrate, register, normalize, data reject, combine the sub exposures, create the RGB image and selective luminance Maximum Entropy deconvolution. The galaxies are shown rotated 135° clockwise. This beautiful group of galaxies is located in the constellation Virgo. The largest galaxy is NGC 5566 and is about 78 million light years distant. To the right is NGC 5569 at a distance of 92 million light-years. This galaxy shows no interaction with the other two. At the bottom, and 90 million light-years away, is NGC 5560. 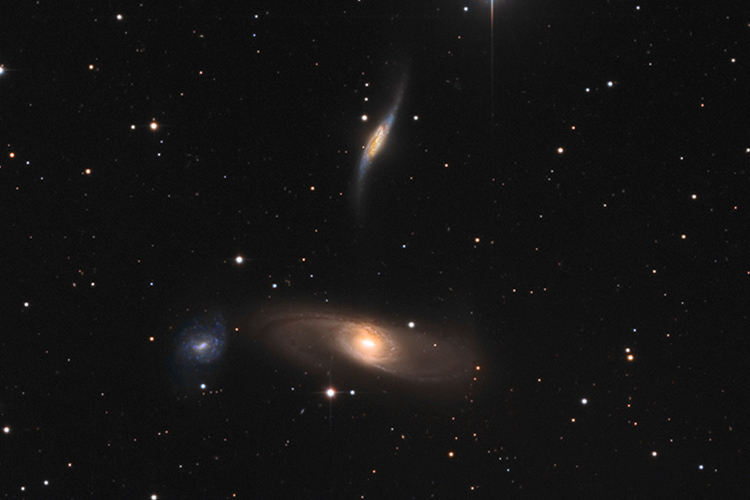 NGC 5566 and 5560 are an interacting pair. The nearly edge on view of NGC 5560 shows distortion. On the left end of NGC 5566, we can see a faint plume extending towards the lower galaxy. The image contains eight distinctly blue quasars with redshifts from 0.80 to 2.14. There are also two QSO candidates.